Bjork! Bjork! Bjork! Dang nothing happened. I thought maybe I could conjure up the faerie queen. Well, she’s probably to busy right now to be conjured. She’s still touring and doing all kinds of press. For starters, you can find a fabulous interview with Bjork in the amazing online magazine Dummy Mag. It’s a virtual magazine that you actually turn the pages of. I love these tree-free magazines! Her interview is on page 66, but you might not want to skip ahead. There are articles/interviews with Bonde do Role, Justice, Maccabees, Dizzee Rascal, Skull Disco and more with lots of big glossy looking photos. Surprisingly it loads super fast. I need to learn that trick. Must be a flash thing. Over on the opposite side of the web (literally, from zmag.co.uk to apple.com) Alan Pollard profiled the technical arrangement of Volta for Apple Pro. Alan Pollard has an insider’s perspective as Bjork’s technical director for a full 10 years. He must be pretty good at his job. He’s in charge of the technical aspects of her music, and is especially important to her on tour. In this feature, he talks about how he packs the entire faerie kingdom into a laptop (lemme guess, a MAC laptop) and the details of how to make all her mechanization work seamlessly with her human performance. It’s a stellar read for studio and gear buffs. And, If you are able to catch her 2 shows in Nimes France in August, you will also get to see M.I.A. when she opens for Bjork at these 2 shows! 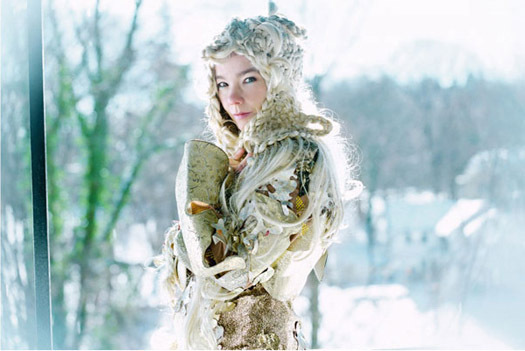 This entry was posted on Thursday, 14June07 at 9:46	and is filed under +Greatest Hits+, Bjork, culture, electronica, experimental, free, industry, interview, music, music tech, news, noise, pop, shows, technology, tour. You can follow any responses to this entry through the RSS 2.0 feed. You can leave a response, or trackback from your own site.